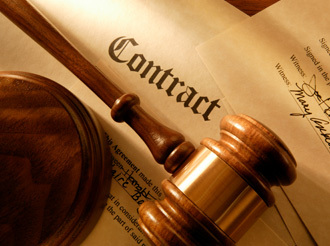 Law of Contract is that branch of commercial or business law, which ensures that the promises made by one person to another in respect of any transaction shall be performed by the parties exactly in accordance with the arrangement between them. And incase of any default the party at fault shall compensate the innocent party. Agreement is defined as “every promise and every set of promises forming the consideration for each other is an agreement.”Agreement is said to be enforceable if it is recognized by the court of law. 1.Offer and acceptance: for an agreement there must be a lawful offer by one party and a lawful acceptance of that offer from the other party.2. Legal relationship: it arises when parties know that if one of them fails to fulfill his part of the promise then he shall be liable for the failure of a contract. Lawful consideration: it means that there should be something in return for both the parties.4. Capacity of parties: the parties to an agreement must be competent that is they must be of the age of maturity as well as of sound mind.5.Free consent: the parties must have agreed upon the same thing in the same sense and that the consent must be free of any coercion, undue influence, fraud misrepresentation or mistake.6. Lawful object: the object for which the agreement has been entered into must not be illegal, immoral or must not imply injury to the person or property of another.7.Writing and registration: contract can be oral or in writing. But in case if it is written then it should also be registered by the court of law.8.Certainty of terms: the terms of an agreement must be clear, complete and certain. 1.2 What is a Contract? 1.4 What is a Promise?